Timpani – or kettledrums (the same thing, just a more old-fashioned name) – have been largely ever-present in the orchestra from the early 18th century onwards. Originally being found in pairs and of relatively small sizes, they would have been used processionally mounted either side of a horse. Fast-forwarding to the 21st century, it’s now safe to assume a set of four, in sizes ranging from 23” in diameter to perhaps 32”, each of which is equipped with a pedal giving each timp a range of about a 6th – varying according to make. 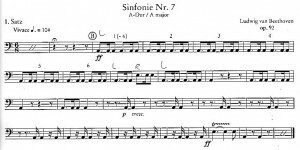 Timpanists despair of anyone ever writing properly for the timps, and I’d love to be able to give you an insight into perfect timp writing, but it’s such a minefield that all I can do is call your attention to some examples of good and bad practice, throw you a few tips, then leave you to be insulted by timpanists. It’s inevitable. Don’t take it personally. The first rule of writing is not to confuse a timpanist with a percussionist. There are people who do both, but there are rarely specialists who cover both. Many professional timpanists will refuse to play percussion if you write it in their parts – and at best will get the huff. Percussionists will play timps within a contemporary or chamber music setting (think Britten operas), and in the theatre you are unlikely to get a specialist timpanist. Context is everything. More than perhaps any other instrument, you are at the mercy of the timpanist and his or her instruments. 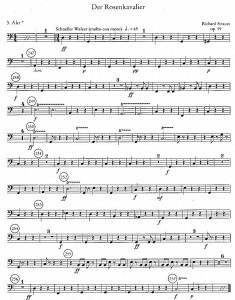 What you can write for the timpanist of the LSO is light years away from what you can write for the timpanist of the Oswestry Young Hopefuls Wind Band – regardless of how good or bad the timpanist of that band might be. The LSO will have access to a large number of well-maintained pedal timpani, whereas our Young Hopeful will be lucky to have anything more than two old drums, probably without pedals, probably with knackered skins. There are basically two types of pedals – balanced action and clutch – but you don’t need to know about that, and I don’t intend to waste your time writing about it. Grateful? I hope so. Again, just listen out for good and bad practice, and ask a timpanist when in doubt. There are rarely any good reasons to write complicated parts for timpani. I think I speak for most percussionists when I say that I hate composers telling me what sticks to use. If you must, stick to ‘hard’, ‘medium’ and ‘soft’. The actual relationship between the stick and the attack of the sound produced is much more subtle than simply being down to the hardness of the sticks; if you hear a timpanist playing your music and you want more (or less) attack on the note, say so. That’s what’s important – the sound – not the technical means by which the sound is made. Often, if during a rehearsal a composer asks me to use harder sticks, I will pretend to change sticks, then play with exactly the same ones but with a different attack, just to see if the composer notices any difference. Naughty, I know, but that’s what I am. There aren’t many available to the timps. Glissandi, playing in the centre of the drum (where it makes a dull tuneless ‘thud’), playing with coins in the hands (in Elgar’s Enigma Variations, Variation 13, where the sound is meant to imitate a ship’s engines – not actually written by Elgar, but apparently approved by him), damped or coperto (covered) are all possibilities, but in many of these cases there is a different percussion instrument that can do the job equally as well. At one point in West Side Story Bernstein asks for the timps to be played with maracas – special timp sticks with inbuilt shakers are available for this effect. It sounds terrible. Asking a timpanist to do anything untoward to the head of the drum is likely to result in a refusal. Timpani heads are expensive and easily damaged. Just don’t. One very subtle effect occasionally found in contemporary music is to rest a cymbal upside down, or a temple bowl, on the head of the timp; strike the cymbal (or temple bowl) and gliss on the pedal; the head of the drum picks up the resonance of the harmonics as it passes, leading to a haunting, whistling type of glissando. It is, however, almost entirely inaudible if anything else is going on at the same time. The best advice, when all’s said and done, is to talk to the timpanist. There are just too many differences between instruments and players for there to be a ‘one size fits all’ approach. Here are some examples of interesting writing. About as tricky as you can go. There’s time to pedal between notes, but your feet are permanently moving. If you write something this intricate, check first. And definitely don’t write this for the Oswestry Young Hopefuls Wind Band. Every timpanist loves playing Beethoven. You don’t need anything more than two timps, and tonic and dominant (nearly all Beethoven parts are tonic & dominant) to provide driving, evocative and colourful music that both underpins and lifts the orchestral score. It’s there where it needs to be, and not there where it would be superfluous. Listen to Beethoven and learn. This makes an appearance for no reason other than it is possibly the most fun you can have with a pair of timps. Whenever you see this symphony being played, please think of the timpanist. While he or she is desperately trying to look composed and dignified, inside his or her head is a voice going ‘wheeee!!’. Honestly. Like the Bartok, it’s tricky, but playable. There’s time to pedal, and it supports the harmonies beautifully. Lots of changes, but all for a purpose, and giving the timpanist time to phrase and to play musically. 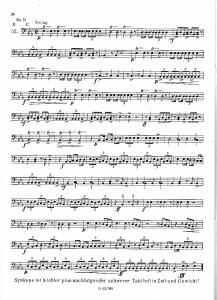 Four timps within a minor third is not of and in itself unreasonable, but these four timps have to cover a normal orchestral range – so the lowest of these timps is screaming at the top of its range, and the highest is tub thumping on a slack skin. 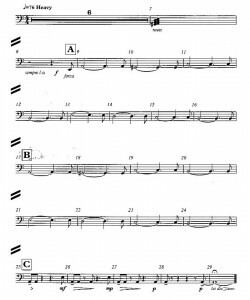 Add to that the fact that the passage is easier to play if the Db and D are reversed (so then you can play it left-right-left-right etc with no stick crossing), and then those two drums are not in their most effective ranges either. And what effect do you get from all of those notes, none of which can be dampened, unless you put a cloth on the side of the timp? I’m not convinced. Too many notes, my dear Richard, too many notes. As this is music for a film that hasn’t come out at the time of writing, I’ve been asked not to name either the film or the composer. How very mysterious. 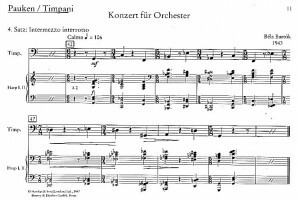 This is good writing, although I suspect that’s by accident; the fact that the composer lists all the notes at the beginning implies that he expects them all to be available – so playing with 7 timps. I don’t have arms long enough to reach 7 timps. However, he’s written with plenty of time to retune, and the notes are allowed to sound. It looks and sounds like a timp part. But if I told you who wrote it, I’d have to kill you. Finally, a study by a timpanist, from a book of technical exercises. You will see that he notes which timps you should tune to at the beginning (you don’t need to do this), and oddly, they’re not in pitch order. Looking through, I can’t really see why this is. Any advantages in particular passages are outweighed by difficulties in others. But overall, this is a good example of how timpanists might think. I just think that any timpani music written in swing notation is on highly dodgy ground. Unless you’re Eric Delaney (check this YouTube clip, filmed when he was 85 – go in at 7’30”… and don’t ever ask timpanists to play with snare drum sticks…). And nobody will ever be Eric Delaney again.